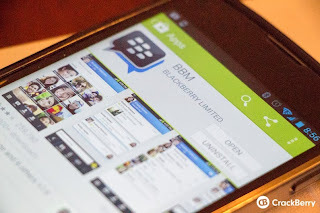 Just over a week ago BBM launched on iOS and Android to an amazing reception. It was an instant hit, quickly shooting to the top of the App Store and ultimately hitting number one in Google Play for Top New Free as well. BBM has seen well over 10 million downloads at this point and is still going strong. BlackBerry has announced today that BBM has ended its first week with over 80 million active users, including 20 million new users from Android and iOS. 20 million new active users - that's 20 million users who are actively using BBM, not just downloads. We're not sure of the total installs, but given that the number of new active users is 20 million, we can only imagine that the total number of actual downloads is much higher. BlackBerry is smart to measure by active users as opposed to just download numbers so we can get a real gauge for the traction of BBM on other platforms. It doesn't look like things are slowing down at all. “It is great to see so many people downloading BBM, but the true measurement for us is engagement – the connections being made and the conversations in which our BBM community engages. The power of BBM has always been the active, real conversations and interaction that our customers enjoy,” said Andrew Bocking, Executive Vice President of BBM at BlackBerry. “From here on out, we will focus on active users of BBM and will no longer focus on simple download numbers." Awesome job for BBM and BlackBerry - we can't wait to see how much more BBM takes off in the coming weeks, especially with the addition of BBM Voice, BBM Video and BBM Channels.